Nokia phones are back on the scene in 2017 as we know that from the 90s Nokia has been out of the game for a long time. There are a couple of Nokia phones that are launching out; out of which Nokia 6 is the one. Let's have a look. First off all this is one sturdy phone, it looks and feels great. The body is solid and all metal. I appreciate the weight especially knowing that it's due to the industry leading sturdiness that Nokia phones are known for. The frame edges are quite sharp and even though we are not fans of their shiny polish we appreciate how good of a grip they provide. Overall we'd say the Nokia 6 is one solid phone with great looks but it's not the most compact 5.5 inch. The exterior is pretty standard for a modern smartphone. A 3.5mm headphone jack is included and that's a relief. Near the top, there is an 8-megapixel selfie camera and the phone's earpiece. This earpiece doubles as one of the stereo loudspeakers, the other is located at the bottom of the phone. Right next to it there is a micro USB 2.0 port and the microphone. The hybrid dual SIM slot is also on the left side. This allows you to expand the storage if you don't need dual SIM functionality. The fingerprint reader is front mounted and located between two touch-sensitive navigation keys. You can use it to unlock your phone and it also acts as a home key. The reader responds quickly but it's not the most accurate we've ever seen. It's also positioned quite low on the phone's body which for some might feel awkward. The Nokia 6 has a 5.5-inch display and is protected by Gorilla Glass 3. It's among the brightest screens in this price segment and is easily usable in sunlight. The contrast is also good and if you switch the screen setting to warm you get great colour accuracy as well. 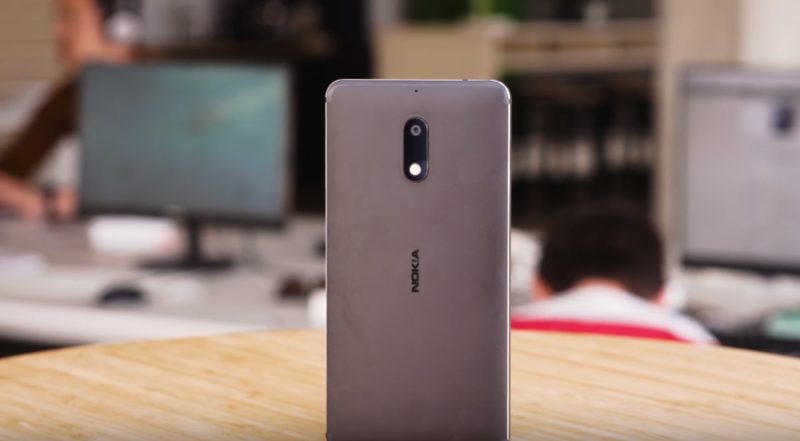 The Nokia 6 scored a battery endurance rating of 75 hours. So it's above average for its class but certainly not a battery champion. The talk-time and the standby battery draw were particularly good. The 16-megapixel camera on the back sticks out of it doesn't look bad but it can cause the phone to wobble. The camera interface is quite simple if you want the manual mode it's hidden inside the menu. There's not a lot of customization options available here. The image quality on the Nokia 6 isn't that great. There's a decent amount of detail but you can notice a softness towards the edges. The colours feel muted and dull. None of them seem to pop. There is an HDR mode but it doesn't seem to add anything positive. The Nokia 6 shoots video in plain 1080p at 30 frames per second. No 4k here. The video quality is pretty good, there's plenty of detail and textures look natural but the colours are again a bit of a letdown. 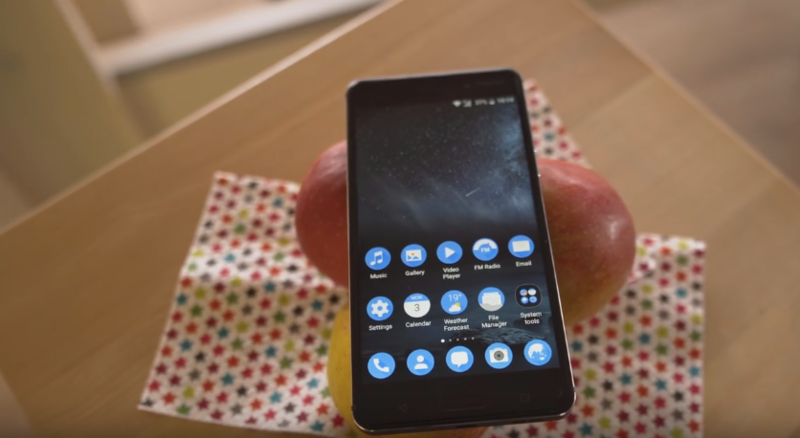 The Nokia 6 boots Android 7.0 Nougat with Nokia's customized UI on top. On the Nokia home screen, all the system items and pre-installed apps are painted in Nokia blue and they're all circles. Aesthetics aside this makes it hard to find a particular function at a glance. All third party apps have their normal icons though you can use an optional app drawer or just keep all of your apps on the home screen. Unfortunately, you can't customize the looks of your UI with themes. The notification shade is easy to get to and the toggles are big but there is no way to toggle the auto brightness mode from here. Inside the phone, we have a Snapdragon 430 chipset with an octa-core CPU. It's still an entry-level mid-range processor. In my tests, it didn't stand out in any particular way. Would say that in regular use the smartphone ran smoothly, it was responsive and we didn't have any glitches to speak of. Even better the phone remained cool throughout my entire testing session. To wrap it up, the Nokia 6 has an awesome build quality but an entry-level chipset. The screen was very good across the board while the cameras failed to impress us in any way. The Nokia 6 is a solid phone with an attractive price tag and it's a great phone to recommend.